Breakthrough E Ink® display for the best just-like-paper reading—even in bright sun—with our proprietary Best-Text Technology™ that produces super-sharp fonts. Hands down, it’s the best Reader. With the longest battery life, you can read for over 2 months1 on just one charge. That’s enough time to start and finish a lot of great stories–or an entire series. 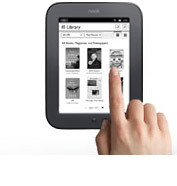 Over 2.5 million NOOK Books not enough? NOOK lets you borrow books in the universally accepted ePub format – so you can borrow and read eBooks from your local library! Reading time is your time and you don’t want to be interrupted. NOOK lets you immerse yourself in your books, magazines, and newspapers without being distracted by annoying ads that appear in other Readers.